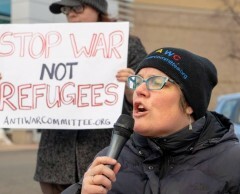 Minnesotans protest Senator Klobuchar’s pro-war record | Fight Back! Minneapolis, MN - On March 15, 30 protesters gathered in front of Senator Amy Klobuchar’s Minneapolis office to condemn her support for the Trump administration policy of regime change in Venezuela and support of U.S. aid to Israel. Since Klobuchar has kicked off her presidential campaign, the Twin Cities anti-war movement has responded by holding multiple protests, including a picket at her presidential announcement at Boom Island, to draw attention to the senator’s long record of voting for military aid and U.S. intervention. Christine Hauschildt, also a member of the AWC, addressed the crowd on the senator’s hawkish stance on Venezuela, “We are concerned with the overwhelming negative impact that the U.S. intervention has had on the safety and security of the Venezuelan people. Senator Amy Klobuchar does not share that concern.” Instead, “Senator Klobuchar supports the destabilizing a foreign, elected leader through U.S. intervention.” This intervention includes the brutal sanctions imposed on Venezuela, disguising weapon shipments to the right-wing Venezuelan coup forces as ‘humanitarian’ aid, and the sabotage that affected the Venezuelan national electrical grid. Meredith Aby-Keirstead, a member of the Anti-War committee, was the last speaker at the protest. She contrasted the courageous stands by Representative Ilhan Omar with the terrible positions that Senator Klobuchar has taken during her run for president. Minnesota’s 5th district Representative Ilhan Omar dared speak truth to power about the American Israel Public Affairs Committee (AIPAC), and exposed the injustice of Israel’s occupation of Palestine. Senator Klobuchar is the only Democratic presidential candidate to vote to penalize the BDS – the Boycott Divestment Sanctions movement; she is the candidate seeking to be recognized as most friendly with AIPAC, and joined in the racist attacks against Representative Ilhan Omar. The protest was organized by the MN Anti-War Committee and endorsed by the Minnesota Peace Action Coalition, Students for a Democratic Society (SDS) UMN and Women Against Military Madness. The next Twin Cities protest concerning U.S. intervention in Venezuela will be on March 30 at 1:30 p.m. at the intersection of Lake Street and Minnehaha Avenue in Minneapolis.